You can finally keep your cell phone close by while you sleep and be safe from the EMF emissions. Whether you use your cell phone as an alarm clock or want it close by in case of emergency calls, the HARApad Sleep Shield provides the EMF protection you need. This is will fit ANY size cell phone. This is extremely simple to use. Just set the product on your night stand or bed, set the phone on either of the flat surfaces, and make sure that the vertical wall is between your phone and your body. 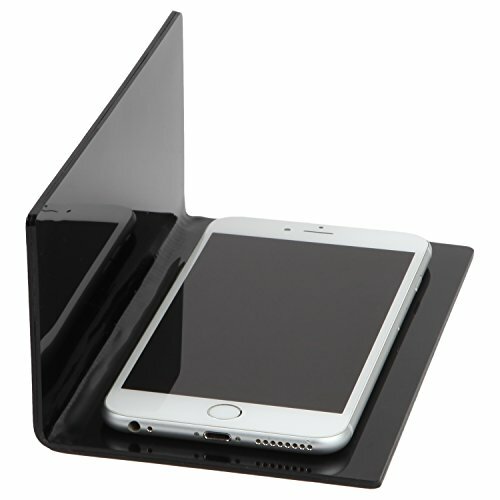 The product has 3 separate materials inside that block all the sources of cell phone radiation emitted from the device- bluetooth, WIFI, RF radiation, and ELF magnetic field. As far as your health is concerned, it's as if your phone is in airplane mode. Yet it will still operate perfectly normally so you can receive calls or texts, and use it for anything you need in a hurry. It works exactly like the lead vest you wear when getting an X-ray (although this type of EMF requires a different material for shielding). The HARApad uses lead- and tungsten-free, military-grade electromagnetic radiation shielding to attract the extremely low frequency (ELF) radiation emitted by laptop computers. The shielding creates a path of least resistance for the radiation to travel through, allowing it to flow through the HARApad itself, instead of your body, and then back to the laptop to complete the path. These statements have not been evaluated by the Food and Drug Administration or any regulatory agency. The products listed are not intended to diagnose, treat, cure, or prevent any disease or condition. If you have any questions about this product by HARApad, contact us by completing and submitting the form below. If you are looking for a specif part number, please include it with your message.